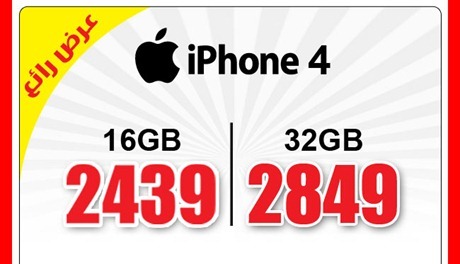 We just got an e-mail from Jarir Bookstore, the e-mail says that Jarir Bookstores is reducing their price of iPhone 4. 16 GB will cost at 2,439 and 32 GB will cost at 2,849. My colleagues got their iPhone 4 from Mobily which is worth 2,400 but they have to pay 89 per month. So it is now a decision whether to take it from Mobily or from Jarir Bookstore. I donâ€™t know if face time is available in this phone. Anyway you can always jail break the iphone. So will iPhone 5 come to market soon ? I want to purchase an iphone4s on monthly installment basics from Jarir book store. I have an account in SAAB. Becouse I had purchase on installment Labtop and a Nokia on basics my SAAB CARD..
hi, i want to buy i4s phone.can i pay by instllment ? or do u have outher system ? how much is the ipad 2 16 or 32gb 3g in philippine peso? tnx. I think installment is not available in Jarir, the only remedy is to get a credit card and pay it in installment basis through credit card. Are all the items on cash basis only or do you also do monthly installments?Can I buy the phone and pay it in installment or only cash?